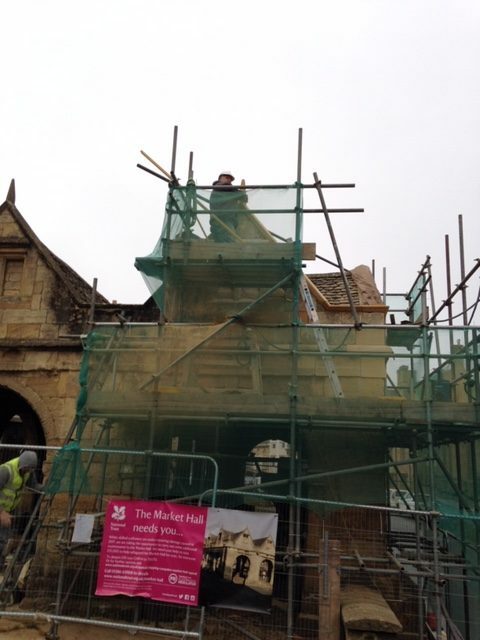 Campden’s Market Hall is back to its former glory, perhaps a little too sparkling, but the new stone will soon weather. In December 2017 there was an unfortunate encounter with the arm of a JCB after the Christmas tree had been installed, and the work was completed twelve months later, just in time for the Christmas Lights to be switched on. The Market Hall, built in 1627 by Sir Baptist Hicks, is owned by The National Trust who took great care to ensure that the renovation of this renowned symbol of Campden’s history was carefully done. The conservation mason employed by the builders Sibbasbridge of Stratford-upon-Avon, Andrew Lintern, visited the CCHS Room to view our library of photographs when he had a query about the arrangement of the stone. Andrew had discussions with Rob Grove, Campden stone mason and builder, who added his experience of local stonework. 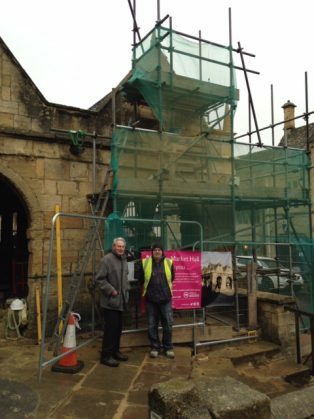 The stone was brought in by Stanley’s Quarry, on Westington Hill, from Oathill Quarry near Temple Guiting. It is a medium grain limestone, ranging in colour from creamy yellow to dark gold. It is a pleasure to see the Market Hall back in use. 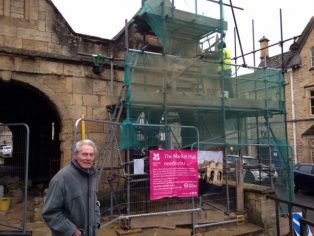 The National Trust has now launched an appeal for funds to do more renovation work to the building, which has so much traffic passing by all day.